Tom Cruise is getting ready to take his annual run at the summer box office. But this time he isn't just starting his own franchise. He's trying to kick off a huge, cinematic universe for Universal with The Mummy. The studio recently announced what they are calling Dark Universe, which will be a series of interconnected monster movies featuring A-list stars. That all starts with The Mummy this weekend and, to get us hyped, they have released not one, but five new clips from the movie. The Mummy, which is directed by Alex Kurtzman, who is making his feature directing debut, has a lot riding on it. And, after a huge weekend for Wonder Woman at the box office, it makes sense that Universal would want to do their best to get people hyped to see this. Especially since tracking for the movie has put it somewhere around the $40 million mark on opening weekend, which doesn't quite seem like enough to justify a cinematic universe. So maybe these clips, which come to us via Movieclips Coming Soon, will help persuade some of those who are still on the fence. The first clip, titled Escape, looks to be from the beginning of the movie, based on what we have seen from the sequence in the trailers. It features Tom Cruise and Nick Robinson pinned down by gunfire and calling in an airstrike to help them out. It doesn't seem to be going well. Next up is a clip called Nick Saves Jenny, which has also been heavily teased in the trailers for The Mummy. In this clip, we see a little more of the epic plane crash, with Tom Cruise giving up his parachute to save Jenny (Annabelle Wallis). That leaves him without a parachute, meaning he has to go down with the ship. Moving on from there, we have Russell Crowe as Dr. Jekyll, in a clip appropriately titled Dr. Jekyll Welcomes Nick. Dr. Jekyll/Mr. Hyde is going to sort of be the Nick Fury of Universal's Dark Universe, providing some connective tissue between these various monster movies. 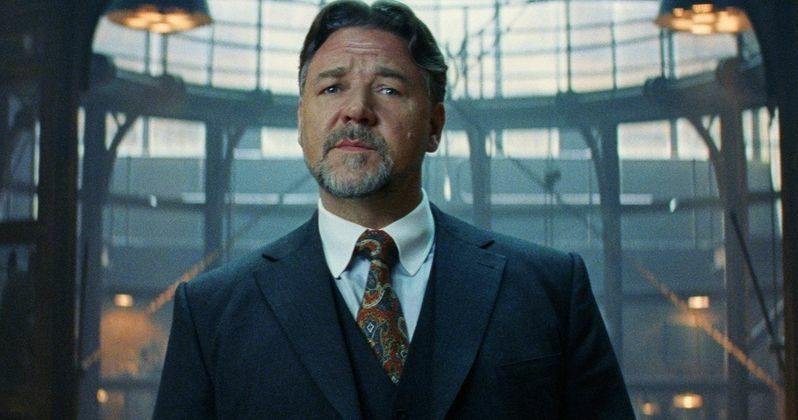 From there we move on to a flashback sequence featuring Sofia Boutella as Ahmanet, with Russell Crowe providing some much-needed context via voiceover. And last but not least, we get to see Nick and Jenny rolling around in a flipped over truck in the woods while being chased down by Ahmanet, which looks pretty cool. All in all, these clips definitely help give a sense of the overall tone for The Mummy, which has been a little all over the place in the trailers. So that's helpful. This weekend will be tough for The Mummy, despite the fact that it is really the only new blockbuster hitting theaters. However, with Wonder Woman taking in a record-setting amount and getting great word of mouth, it should do very well heading into its second weekend. Plus, Pixar has Cars 3 coming out the next weekend, which should do very well with the family crowd. We'll have to see what the critics have to say once the reviews start pouring in later this week, but for now, check out these new clips from the first entry in Universal's Dark Universe for yourself below.